It does not matter what you want, the market seems to always have just the right gaming gadgets for your needs. Unfortunately, more options do not necessarily mean easier choices. No worries though, we’ve taken care of you, so here is a list of some of the best new gaming gadgets you can buy today to absolutely crush it in your favorite online battleship, shooter or strategy. The aLLreLi T9 mechanical keyboard features simple macros configuration, LED lights, and an ergonomic palm rest. The manufacturer suggests that the keyboard is best for playing League of Legends, the macros option should make the keyboard usable for almost all computer games you have. There is also a custom space bar on the lower right side of the device. The lights are bright but they are not blinding at all. Get it here. For a new or casual gamer, the aLLreLi T9 will look like half-a-keyboard. It also appears that it is for left-handed users only; you can use it with your right hand, but the shape can make it uncomfortable. The performance, quality, and ease of use are still above average. Hard Gaming Mouse Pad by Beautiful Tech fulfills your needs for a professional-grade mouse pad with a little bit of flair that wraps the durable materials. It is a multicolor LED mouse pad with nine color modes. The pad features micro-textures for better accuracy and speed, too. On the inside, it brings sheet metal and aluminum alloy for extra durability. As it comes with anti-clip rubber pads, this is the ideal pad for a gaming mouse. Get it here. As far as a mouse pad is concerned, there isn’t really anything it can do to impress anyone. This one, however, makes the desk more pleasing to the eyes and gaming actions more enjoyable. NETGEAR has once again come up with a user-friendly device to help gamers configure the best setting for their needs. Ethernet switches are not particularly gaming gadgets, but you can use them to optimize online gaming performance by dialing the right preset setting. In simple words, S8000 puts gaming applications as a priority and deliver most of the network speed to gaming devices. Get it here. For a reasonably-priced Ethernet switch with QoS technology optimized for gaming, the S8000 from NETGEAR is more than decent. On top of that, this device looks as futuristic as if it came out straight out of Star Trek. GAEMS Vanguard is here to turn your full-size consoles and monitors into the portable gaming environment. It is basically a carry case which features built-in 19-inch HD screen, speakers, and a compartment for a console. It also allows easy connection between the console and monitor. All the cables and small accessories will fit inside just fine without scratching the screen. Vanguard is compatible with PlayStation 4, Xbox One, PlayStation 3, Xbox 360, and XBOX ONE S. Get it here. In general, GAEMS Vanguard does it promises to do. It wraps all major components of a gaming set in a compact easy-to-carry case. Of course, you still need a power supply, so it is portable as long as you carry it to a place with power adapter. Oculus Rift is one of the most popular names in VR-based games. 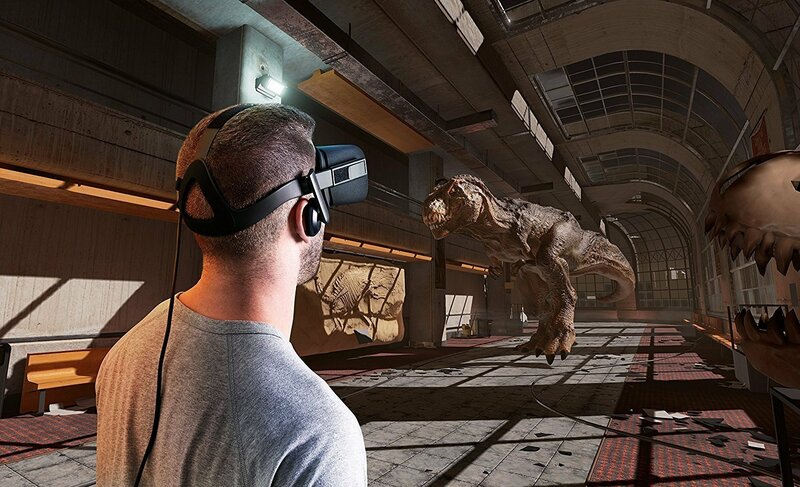 Instead of using a regular joystick or even computer keyboards, Oculus Rift Bundle allows you to feel, touch, move, command, and do anything in the game as if you really are inside the game itself. Oculus Rift VR headset and touch controllers are the biggest major improvements in gaming today. With gestures-based controls and fingers movement, the VR gaming experience is close to perfection. Get it here. If you have been playing games for decades now, chances are you have used all popular consoles out there from Nintendo to PlayStation 4. Oculus Rift VR Headset and Touch Controllers are by far the most innovative of them all. Old-school gaming will still be here for sure, but VR can only be the natural progression of what gaming is now. Blue Finger LED Keyboard with Mouse Pad features 19 non-conflicting keys. You can press all buttons at the same time without conflicting commands, and this is a good design for gaming. The adjustable LED light effects add the cool factors on your desk as well. With separate multimedia control keys, the keyboard, and unique lighting patterns, the keyboard should meet non-gamers’ expectations, too. It comes with a mouse pad. Get it here. It seems that the keyboard was built mainly for the looks rather than gaming-related functionality. It has no macros, but at least the lighting effects deliver some pleasant surprises every now and then. A programmable mouse is one of the most popular gaming devices of all time. It allows you to relegate some of the keyboard’s functions to the mouse. Zelotes Mouse is a good example of that. The mouse features good design and light effects. Instead of pressing multiple keys to execute a command in the game, you can just press one of the buttons on the mouse. It is available in multiple colors such as blue, green, and red. Get it here. The mouse is a basic programmable device for gaming. It ticks many boxes, and that is enough for just about anybody.